What would you rather give up, your wallet or your smartphone? That’s the question that Ipsos Global @dvisor asked in its latest poll. Turns out that as many as 40 per cent would choose their phones over their wallets. 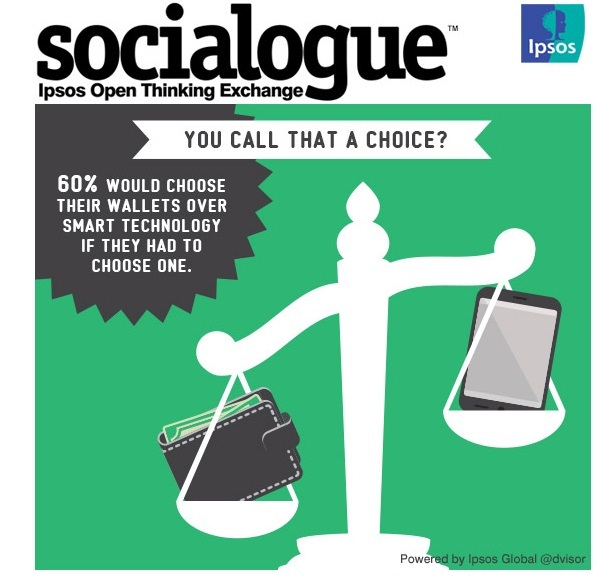 Ipsos is spinning it as the wallet winning out but considering that the wallet is pretty crucial to daily life and has been around a heck of a lot longer, the results are eyebrow-raising. It shows how important a tool smartphones have quickly become in the daily lives of many. Given that many companies and banks are now partnering to offer the ability to turn your smartphone into a digital wallet, we can expect to see trends like this continuing. Not only will people be choosing their smartphone over their wallet if they had to – they’ll be finding they can leave the wallet at home by choice. With NFC-enabled payments on the radar of carriers and banks, MasterPass offering a digital wallet solution with on-location purchases in mind, and StarBucks charging you by scanning a bar code on your phone, it’s easy to see the sort of options that will make this more possible in the near future.